While it's true that bird species such as Cockatoos and some Conures are prone to flaking on their beaks, flaking is not necessarily abnormal. A Cockatoo is a powder down species so one can normally expect this powdery substance on their beak. But why do beaks get flaky? Well, the answers are down to what they're used for and what they're made of. A bird’s beak is a tool for the bird, much like your hand or foot. Birds use their beaks in various ways, allowing them a way to grasp objects, to crack open seeds and nuts, tearing or shredding material used for nesting, or enlarging a nest hole. Birds also use their beaks for climbing. So you can see how important a healthy beak is to a bird! It is not only a part of their body, it is an important part of their daily life. Various species of birds have adapted to their environment and beaks of various sizes and shapes have occurred naturally in the world depending on the various uses they have for the beak. That's why in the wild, you will see beaks of all types depending on what they are used for in their part of the world in order to survive. One of the main factors in how the shape of the beak is formed is determined by what and how they eat. Woodpeckers, for instance, use their beaks to gouge holes in trees locating insects as a part of their diet. Their beak remains sharp and chiseled for this use by the very action of using their beaks on the wood of trees. The beak is made up of keratin, the same substance as a fingernail. Just like a fingernail, a bird’s beak will continue to grow throughout their lives and need to be worn down. This keratin sometimes becomes flaky which is a normal part of the molting of the outer layers of keratin; this molting allows new keratin to develop as the old keratin is worn off. Occasionally you will see this flaking and scaling of the beak as this renewal process continues. In the wild, a bird’s normal daily activities will keep their beak worn down to manageable dimensions as it grows. It doesn’t get too long or overgrown and the continued growth keeps the beak useful for all of the activities that occur. Companion birds normally will wear down their beaks by chewing on toys of various textures. A cuttlebone works well for this condition if your bird accepts it. Also, playing with toys and climbing also helps condition their beak as well as the process of moving about the cage and using their beak to assist with this moving about. 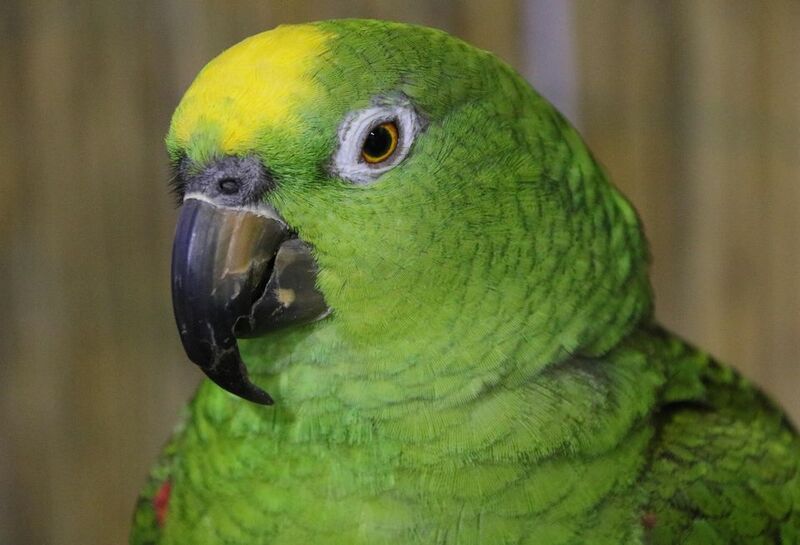 One cause of flaky beaks is a vitamin-A deficiency, an issue that can easily be remedied by making sure your pet is offered a variety of fresh foods and high-quality supplemental pellets. A healthy diet is a good way to ensure that your bird's beak remains healthy and normal. Chop, sprouts, and other fresh vegetables can help. At times, however, a beak can get flaky-looking patches on it as well as "growth" lines. Much like the human fingernail, a bird's beak grows continuously throughout its life, and the new growth can cause the beak to appear streaky or striped. If you think your bird's beak is growing abnormally—if there are abnormal grooves or if pieces of the beak actually flake off—then the best thing to do is contact an avian vet immediately. They will be able to diagnose the problem and help your bird get back on the road to exceptional health. To help keep your pet from developing a beak problem, offer your bird plenty of chew toys or cuttlebones to exercise and grind their beaks on. This should go a long way in keeping your bird's beak healthy, which will, in turn, keep your bird happy and feeling great!